DCEH is hiring a Emergency Rental Assistance Processor for our new pilot program. It is a 6 month part time position with the option to become a permanent position. The Processor will oversee the DCEH Emergency Rental Assistance Pilot Program and work with local residents to keep their housing in times of crisis. The position closes on October 28th and all interested applicants should send a cover letter and resume to info@dceh.org. 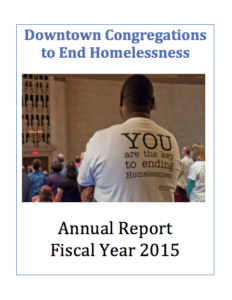 Click on the link below to read DCEH’s annual report from 2015. The report covers all of the great work we did last year in the realms of education, inspiration, advocacy, and service. We are proud of what we have accomplished up until this point. DCEH and our leaders look forward to continuing to make a positive difference, with your help, in the lives of people experiencing homelessness, and the communities which we are we are all a part. 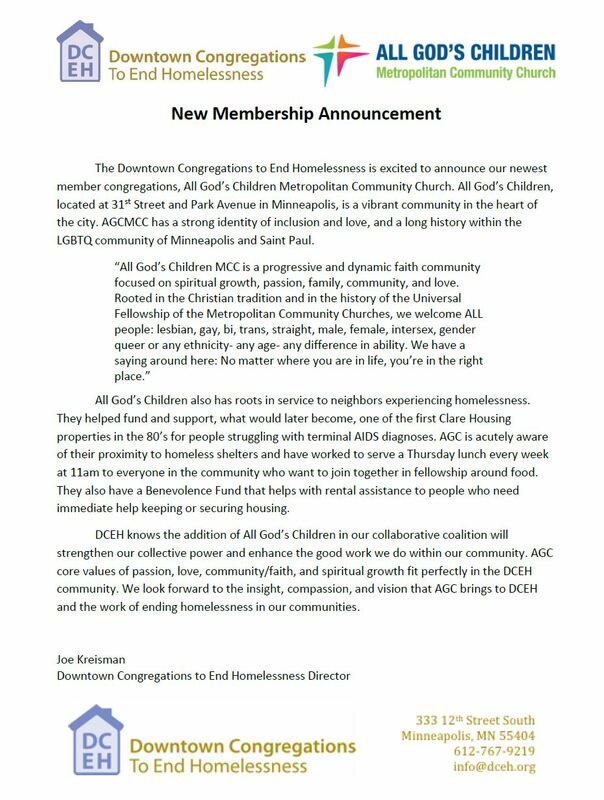 For immediate release—Joe Kreisman has been named Interim Director of Downtown Congregations to End Homelessness. Kreisman has experience in community organizing, lobbying and political campaigns. He also has trained volunteers, resulting in increased contacts and increased voter turnout. Downtown Congregations to End Homelessness calls people to take action addressing homelessness based on their religious values, to strengthen awareness of homelessness and to build advocacy for policy changes. DCEH was part of the coalition that successfully advocated for allocating $100 million for affordable housing in Minnesota, which was approved in the last session of the Legislature. DCEH is a collaboration of 14 churches, synagogues and mosques that has grown in numbers and influence since its founding six years ago. The Affordable Housing Trust Fund creates and preserves affordable rental housing, generates jobs, increases property tax revenue and leverages additional investments. I urge you to fund the AHTF at $10 million. 6,452 children and youth were identified as homeless and highly mobile in Minneapolis, an increase of 1.3% from the previous year. 3,636 were enrolled in MPS, representing 8.9% of total MPS student enrollment. – Mpls Public Schools. With the vacancy rate within our city at 2% and the affordable housing vacancy rate at 0%, there is an immediate need for more housing opportunities. For $1,000,000 in development costs, 16 jobs are created. For every $1 invested through the Minneapolis Affordable Housing Trust Fund, on average, a project receives $9 of additional investment in that project. The Affordable housing trust fund is a city of Minneapolis resource that helps to fund affordable rental housing in the city. When the fund was established, the goal was to commit $10 million through this fund for affordable rental housing every year. This year, the Mayor’s proposed budget funds the Affordable Trust Fund at only $6.1 million. As a faith partner of Heading Home Hennepin, we represent 16 congregations creating an interfaith community to support the work of ending homelessness in Minneapolis. Our Mission: To engage our congregations and the community in the work to end homelessness. Inspire and educate in order to influence public policy changes that contribute to ending homelessness and improve access to housing. Collaborate and coordinate services to people experiencing homelessness. Inspire: Call people to take action based on religious values. Educate: Strengthen awareness of the issues of homelessness and appropriate solutions. Serve: Coordinate delivery of services among congregations. Four key annual events are institutionalized as ongoing activities to bring people together for learning, inspiration, and action, in additional to groups organizing to educate and call people to action. The STEH is a dedicated weekend for individual member congregations to focus on current trends in housing and homelessness, as well as how faith communities speak to this issue and ways congregants can take action. The main tool for STEH is education and inspiration, including, but not limited to: speakers, educational forums, sermons, liturgy, etc. Each year, members are invited to attend the Joint Religious Legislative Coalition Day on the Hill and the Minnesota Coalition for the Homeless Day on the Hill, to meet their legislators and discuss housing and homelessness funding and policy. 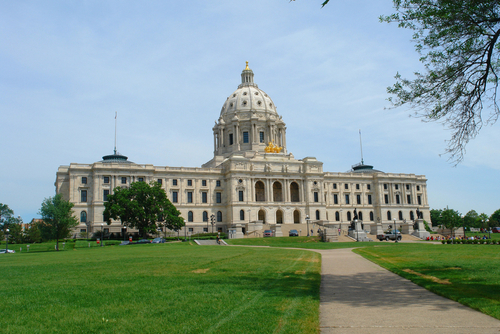 Members are invited every year to attend the Joint Religious Legislative Coalition Day on the Hill and the Minnesota Coalition for the Homeless Day on the Hill, to meet their legislators and discuss housing and homelessness funding and policy. This annual event will educate and inspire as participants hear a shared message, a speaker, a reception, music, opportunities for conversations, best practices, and have a faith component. Provide opportunities for congregants across congregations to serve together with reflection, advocacy, and faith formation. Hold four trainings per year to equip volunteers, to provide a space for volunteers to meet, and gain new knowledge for working with people experiencing homelessness, in a faithful context. Individuals and congregation engage in public policy advocacy as a spiritual practice. DCEH provides a range of public policy education, training opportunities, and other activities; which take place across congregations to build deeper understanding and valuable relationships that will strengthen our interfaith collaboration and impact. DCEH equips a broad and diverse base of congregation and community members with advocacy skills including: calls, letters, emails, meetings, testimony, media outreach, and other productive activities with partner organizations. Participants in DCEH events grow in their public policy knowledge. Congregant participation in advocacy is increased and those engaged find the effort satisfying. DCEH direct service volunteers and advocates develop stories and story-telling skills to create compelling support for policy proposals. Direct Service Providers retain volunteers by developing their skills and knowledge to be fully equipped to work with people (clients, friends). Volunteers are engaged and building relationships across congregations. Partners and elected officials value the unique interfaith voice offered by DCEH. DCEH is perceived to be a resource to elected officials. DCEH has good working relationships with elected. officials at all levels. DCEH is a resource to the press on the issue of homelessness. The Downtown Congregations to End Homelessness is very excited to announce that the new chair of our Steering Committee is Rabbi Sim Glaser from Temple Israel! The position of Chair of the DCEH Steering Committee is a leadership position, which guides the work of the DCEH collaboration to engage our members in the work to end homelessness. Rabbi Glaser has been an Associate Rabbi at Temple Israel since 1999. Rabbi Glaser brings to DCEH his passion for social justice and affordable housing, his creative thinking, his prophetic voice, and his focus on acting together. While at Temple, Rabbi Glaser has been involved or spearheaded efforts to better our world with the neighborhood school, Jefferson Elementary, addressing issues of homelessness, advocating for humanitarian efforts in Darfur, and more. We are so grateful and excited for new leadership. We are also grateful for our outgoing Chair, Rolf Lowenberg-DeBoer, who will take over as Co-Chair of the Steering Committee for continuity in our leadership.